Meet Joe. Joe has a ball, and his ball is a great problem for the whole world. Because of Joe’s ball, the Earth may fall into the sun and the moon may fall from the sky. That’s a big problem for a small ball in Joe’s hand. 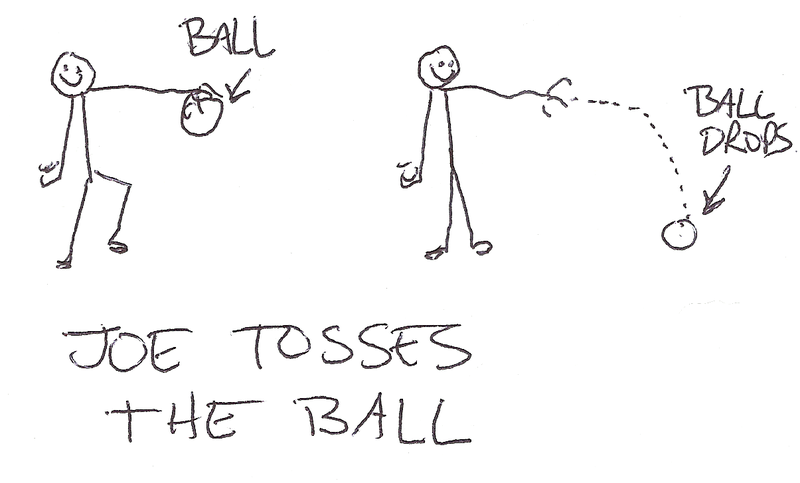 The problem is that Joe drops his ball and then tosses it to the side (see illustration at right). You see, when Joe drops his ball it accelerates at a spectacular rate of 32.2 feet per second per second. Now, Let’s say Joe has a bullet in his hand and drops his bullet. Like the ball, the bullet’s gonna fall to the ground at the same rate the ball did. Let’s next give Joe a gun, and have him shoot the bullet. The bullet is going forward, just like the ball that Joe tossed. 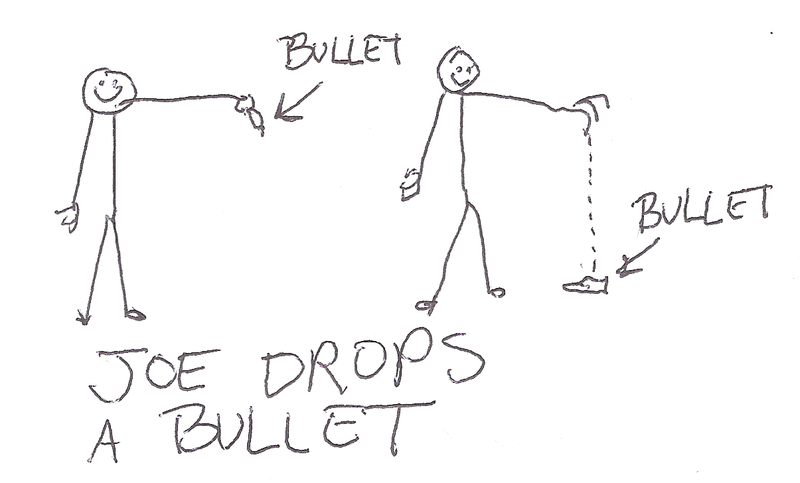 But the forward movement of the bullet from the gun barrel doesn’t slow the downward acceleration of the bullet as it falls to the ground. It just falls to the ground a ways off because the bullet was going fast. 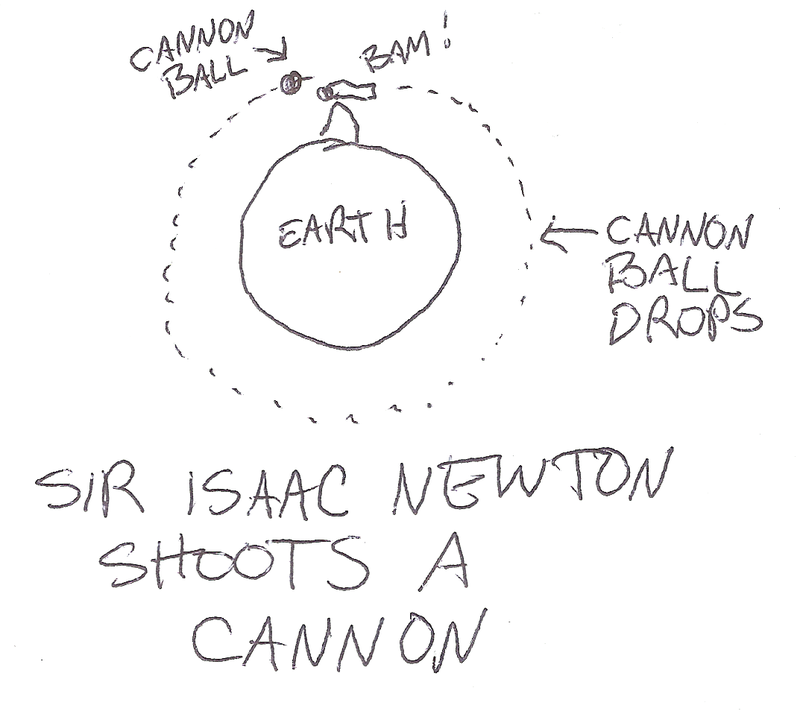 Finally, Sir Isaac Newton shoots a cannon. And his cannon is very powerful. The cannonball goes so fast, so far, that as it falls to the ground, the ground curves away underneath it, and it goes around the world in an orbit. But why? 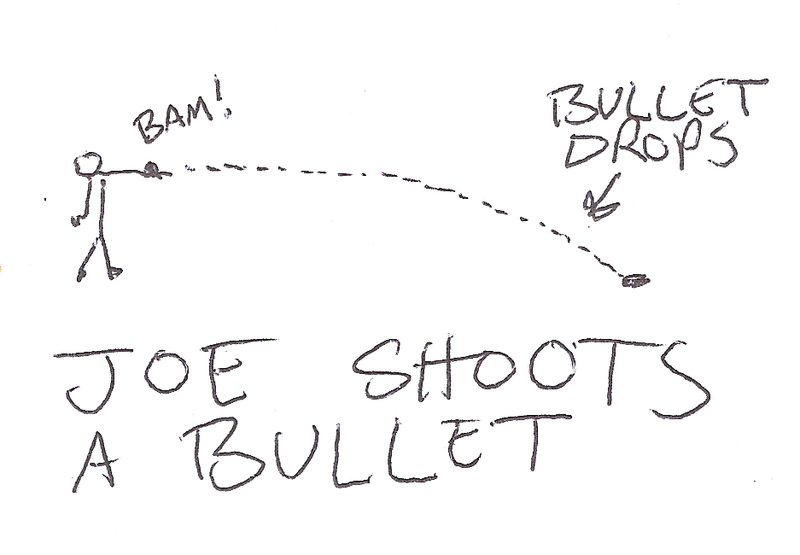 Both the ball and the bullet fall to the ground at 32.2 feet per second per second. They accelerate toward the ground, but Isaac Newton’s cannonball doesn’t. Satellites stay in orbit, the moon stays in orbit, the Earth stays in orbit, and they don’t accelerate toward the ground. How come?